Come meet Varsity Logistics at the VAI Prevail show in Nashville! 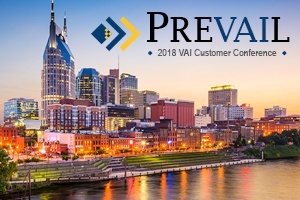 Varsity Logistics is excited to showcase its industry-leading software at the VAI Customer Conference in Nashville, Nov. 8-10, at the Gaylord Opryland Resort and Conference Center. Attendees will have an opportunity to meet Varsity President Yulia Popokh and Director of Sales Charlie Hawkins, plus learn about Varsity’s deeply integrated shipping and TMS functionality with VAI’s latest release of S2K. Understand which warehouse “work-flow” changes S2K customers made to maximize warehouse efficiency. Learn about the various pre-written interfaces available for seamless integration to multi-carrier parcel and LTL rating, planning, execution and auditing functionality. Varsity’s modular structure, which scales the cost of entry to fit most S2K customers, will also be discussed as well as what Varsity’s recently expanded premier partnership with VAI means to you. Varsity Logistics is the number one shipping software for IBM i enterprises. Varsity Logistics offers shipping software solutions for parcel and freight shipping, along with shipping analytics and hardware. With the help of Varsity’s shipping software solutions, your company can ensure total satisfaction with seamless order fulfillment and delivery management covered by Varsity’s ERP. For more information on attending VAI, visit vaiconference.com. See you there!